This unassuming eye make-up remover has me quite excited and an eye make-up remover isn’t normally something to do that. Normally I rely on my trusty No7 remover, which is one of the few repeat purchases in my beauty-life. But when my latest bottle ran out I looked in the collection of products I have in my ‘to-test’ pile and this one jumped out at me. So I gave it a test and I am extremely impressed. Firstly, the packaging is really unusual – it has a somewhat plate-shaped top area that you place the cotton pad on and push down. 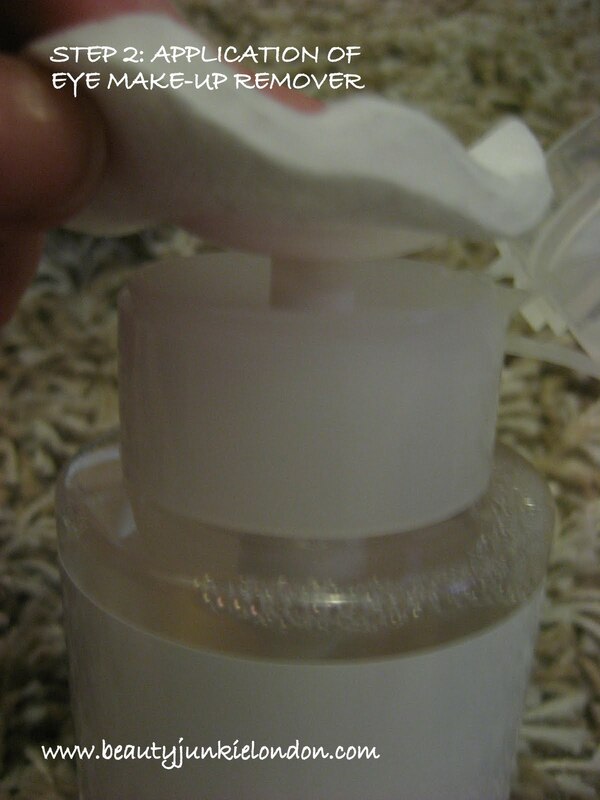 Dispensing the perfect amount in one squirt to remove all eye make-up from one eye. 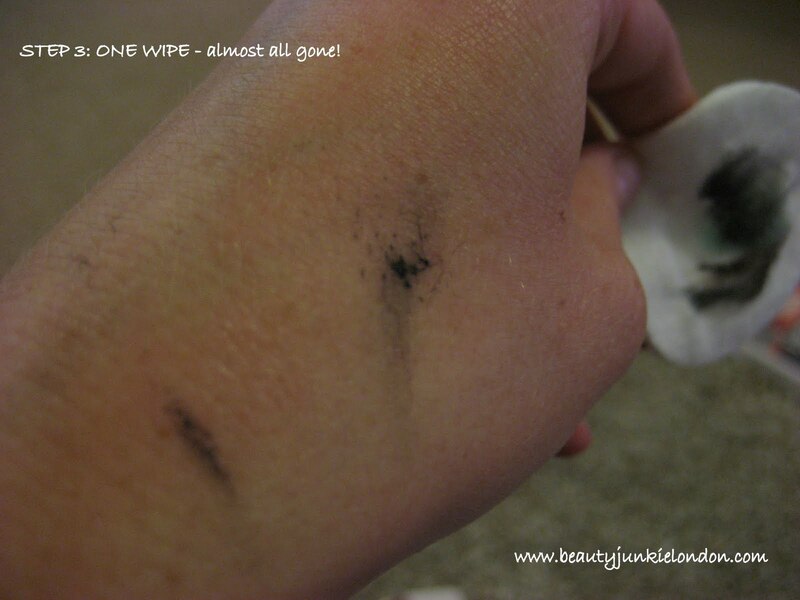 The removal process is so simple, dissolving make-up in a few seconds so no rubbing is required – the eyes wipe clean in pretty much a single swipe. Eye’s are left clean and feeling fresh, with the bonus of no oily residue. 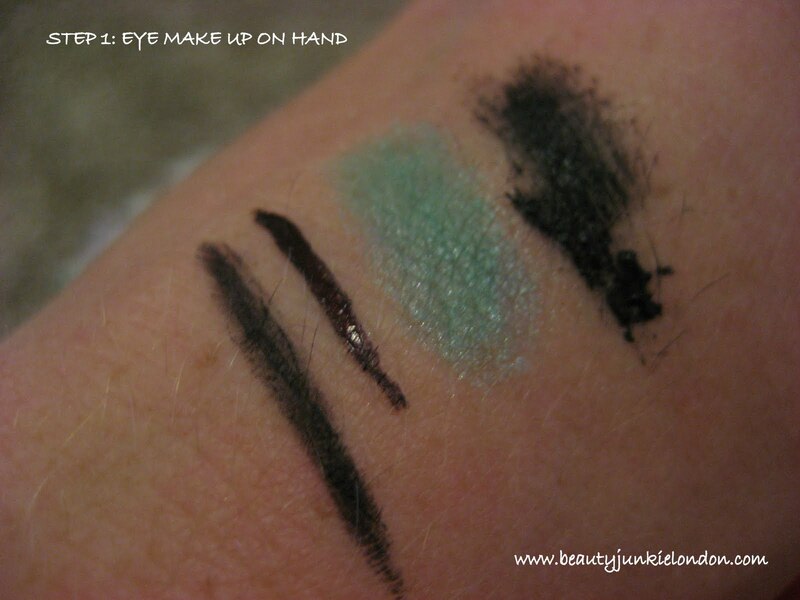 As a demo I’ve done a bit of a test on the back of my hand and done a step by step picture of the removal process of some eye make-up from the back of my hand (mascara, eye-shadow, liquid liner and pencil liner). So there we have it – one swipe and it’s almost all gone. The two smudges at the side are basically only there because the one swipe didn’t cover them. I’m sold – we have a challenger for a new favorite. Well, that is till right now – when I went to the website to check some details and saw the price. This eye make-up remover costs £14 – which I would say is quite steep for a product designed for young girls? Although by looking at the stockists, I don’t think it’s just any young girls that it’s aimed at – it’s young girls with mummy’s who shop at Harvey Nicks…. Nothing wrong with that at all, but for an essentially basic product I still feel it’s quite expensive – although granted, it’s a lovely product. So if this suits your budget, your money would be well spent on this. 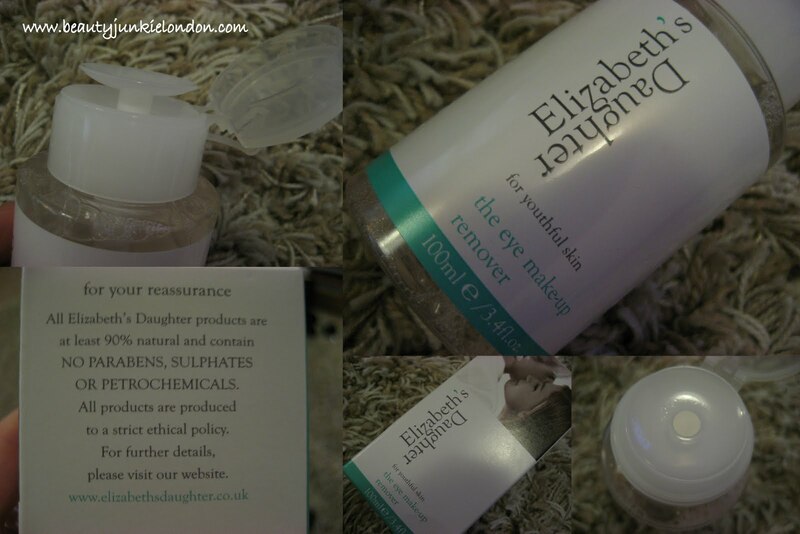 Elizabeth’s Daughter skin care is available from selected John Lewis stores and Harvey Nichols. For more info on the range go HERE. This product was provided at an event for consideration for review. All opinions are honest and my own. Holy crap! This is even more expensive than CHANEL makeup remover! That’s a good call on re-using the bottle! Never thought of that, genius! It was great to hear your comments about our eye Make-up remover. We have had such great positive feedback about the gentleness and effectiveness of the formulation. In actual fact there is an error on the label, it is in fact 150ml not 100ml therefore our price per 50ml is only £4.66. Compare this to Boots No7 at £3.75 per 50ml and (as someone quoted) Chanel at £10.00 per 50ml. We believe our price is fantastic value when you consider the quality of the natural and botanical ingredients.